SEE NEW ARRIVALS PAGE 7_____LIGHTS: FOR UP TO DATE BENSON LIGHTING AVAILABLE FOR SALE. ALWAYS WANTED, GOOD PRICES PAID FOR W.A.S.BENSON LIGHTING OF ANY DESCRIPTION, INCLUDING VASELINE SHADES, COPPER SHADES OR ANY OTHER RELATED ITEMS. W.A.S Benson. 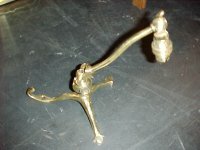 A pair of copper and brass candlesticks. Height 10", Width at base 7". 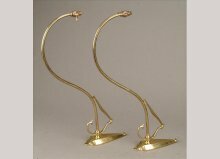 A rare pair of Arts and Crafts brass wall lights, these are unusually long designed to light up a pair of large paintings, the elongated arms are to keep the heat of the bulbs away from the paintings. Was Benson. A copper and brass table lamp by WAS Benson with stylised scroll detail to the top, original switch and leaf style feet. Stamped Benson. Approx measurements Height 12", Width at base 5". WAS Benson. An Arts and Crafts cast iron four leg table oil lamp. Height 18", Width of base 8". Circa 1900. A good quality rare pair of Arts and Crafts three branch ceiling lights in the style of WAS Benson. Height 21" + a 9" chain so a drop of 39" or less if the chain is shortened, Width 24". Circa 1900. WAS Benson. An Arts and Crafts brass four leg table lamp. Height 18", Width of base 9". Circa 1900. WAS Benson. An Arts and Crafts four leg table oil lamp converted to electricity. Height 13" , Width of base 7 1/2". Circa 1900. WAS Benson. 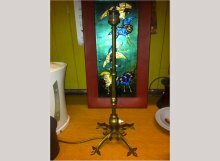 An Arts and Crafts brass three leg table lamp. Height 10 1/2" , Width of base 7 1/2". Circa 1900. WAS Benson. An Arts and Crafts brass table lamp with Heart shaped base. Height 10" , Width of base 7". Circa 1900. WAS Benson. 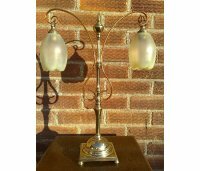 An Arts and Crafts silver plated table lamp with Heart shaped base with counter weight ball. Height fully extended 12" , Width of base 6", Depth of base 7". Circa 1900. A pair of brass and copper candlesticks by WAS Benson, stamped Benson beneath the candle holder as shown. W.A.S Benson, stamped. 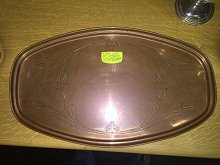 A copper tray enscribed with stylised floral details. A rare W.A.S. Benson brass and copper oil lamp, one of the few with period exhibition images. A beautiful pair of Swans. WAS Benson brass table lamps in the form of Swans with Heart shaped bases. Height 18 1/2", Length of base 7 1/2". Circa 1895. A magnificent large Benson oil lamp. Height 38" and the feet are 16" apart. Circa 1895. Two W.A.S. Benson Arts and Crafts oil lamps. Left the larger one is £SOLD. Right smaller one Height 18 1/2" to the top of the burner and 27" to the top of the shade holder and 9 1/2" across at the tripod base. £POA. Copper and Brass twin candelabra stamped W.A.S. Benson. Height 12" Width 12". Circa 1900. A rare pair of WAS Benson ceiling lights with stunning stlyised floral and heart detailed gallery holding their original swirling clear glass shades incorporating brass finials. Height from top of gallery to bottom of shade 7", Width 12". Circa 1900. 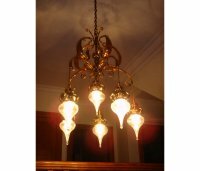 An exceptional Arts and Crafts copper chandelier by W A S BENSON retaining the original teardrop swirl shades and copper galleries, in original condition. Height with out chain 36", Width 30", shade drop 9". Circa 1900. 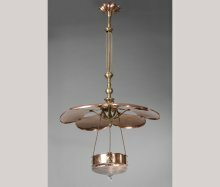 An outstanding Arts and Crafts brass and copper lily pad reflector chandelier with three electric cables that support the lower copper ring holding the original cut glass shade with three bulb holders inside the shade. It has a registered design number stamped into it Rd 235457 which dates it at C1894. Width of cut glass shade 8 1/4". A pair of Arts and Crafts copper and brass wall lights by W.A.S.Benson. A similar style was used in Phillip Webb's Purbeck Marble entrance for Luke Ionidis at 1 Holland Park Rd, one of the important patrons to the circle of W Morris friends and artists. A single version is illustrated in Jeremy Coopers Victorian and Edwardian Furniture and Interiors, Page 172 Illustration 446. They extend 20" from the wall. The curled leaves are 10" apart. Circa 1890. Width 14", Height 4". Circa 1895. 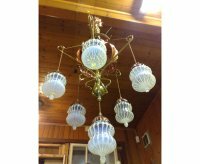 An outstanding and extremely rare Arts and Crafts copper and brass chandelier with 6 James Powell of Whitefriars Vaseline shades. Absolutely stunning these images do not do it justice, an exceptional piece. Height of chandelier from ceiling without chain 4', original chain is 36" long so one can hang it from 4' to anything between a 7'drop depending on chain, Width shade to shade 25". Circa 1900. 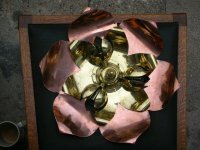 A WAS Benson brass and copper table lamp in the form of a large flower. 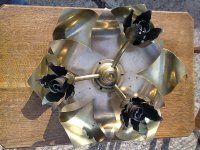 A WAS Benson brass ceiling light in the form of a large flower. Perfect also for a low ceiling. Width 14", Height 6". Circa 1895. In the last image the bottom left hand image see 'WAS Benson' by Ian Hamerton. 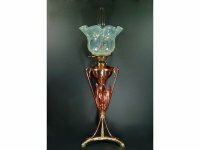 A rare WAS Benson brass and copper 3 leg oil lamp with removable font in the form of a large flower. Height 30 1/2". Circa 1895. 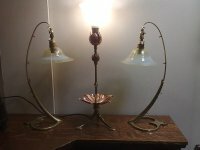 A beautiful Arts and Crafts copper and brass twin arm table light by W.A.S.Benson with original heavy Vaseline Powell shades. Retaining it's original laquered finish. Height 19", width of arms 13", the base is 5" square. Circa 1900. A rare WAS Benson brass and copper 3 leg oil lamp with removable font in the form of a large flower with original James Powell Vaseline shade. A WAS Benson brass and copper 4 leg oil lamp in the form of a large flower with original James Powell Vaseline shade. Height 31 1/2". Circa 1895. A rare Arts and Crafts adjustable table/desk lamp by WAS Benson. Height fully extended 32" or 27" down, Width at the base 11 1/2". Circa 1900. 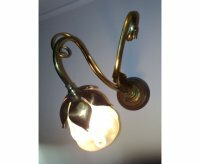 A very rare Arts and Crafts brass table/bed lamp by WAS Benson, the best quality and in superb condition, totally original with swinging arm to hang off a bed or picture rail etc. It has the early Benson Hammer marks so rare it's not in the original Benson Catalogue. I've never seen another. Height 10 1/2", Width at the base 6 1/2". Circa 1900. A stunning pair of silver plated and copper candlabras by WAS Benson. Height 18", Width 10". Circa 1900. A brass and copper oil lamp with Vaseline floral shade. 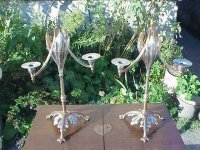 A pair of W.A.S.Benson brass and copper candelabra's. 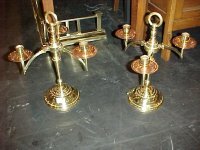 A pair of W.A.S.Benson brass and copper candelsticks. A fabulous table lamp attributed to WAS Benson with a good James Powell of Whitefriers shade. C1890. 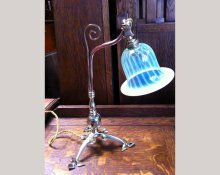 A superb WAS Benson oil lamp, with conical vasaline shade by James Powell of Whitefriars London, James Powell made glass shades for most of the lighting designed by Benson and they were the most importatant Glass blowing company of the period. Width of base 9 1/2", Height to top of font 16", Height to top of Vasaline shade 24". Circa 1900. A Benson brass and copper oil lamp, the same type used at Standen. Height 13 1/2", Width 12 1/2". Circa 1890. Was Benson. A rare steel table lamp by WAS Benson with heart shaped base and original brass switch. Height 10", Width at base 5".